The beginning of the school year is here, and we have just the thing to make that first day even more enjoyable. Tropical Shortbread Cookies from Hawaii’s Local Buzz make the perfect finishing touch for a brown-bagged lunch, or a satisfying after-school snack. 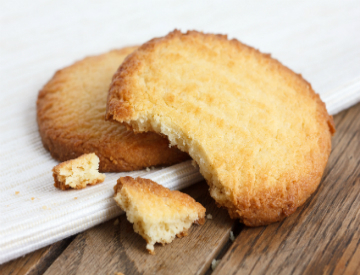 Your child will love celebrating the end to the first day of school by biting into one of these melt-in-your mouth cookies, and you won’t be able to help snagging one for yourself. They come in four fruit & macadamia nut flavors: mango mac, pineapple mac, and pineapple coconut mac, along with a few other Hawaiian specialty flavors: Ka’u coffee, macadamia nut, cinnamon sugar, and our newest flavors — Chocolate Chip Shortbread and Ka’u Coffee Chocolate Chip. Order a couple of different varieties, and you can enjoy a new one after every school day in the first week! Each batch of our cookies is hand-crafted, so you can count on ever bite being satisfying and perfect. If you’re not sure which flavor sounds most enticing, feel free to try a few. We sell our 1-ounce cookies individually, as well as in packages of 7, and we have 4-packs of out smaller 0.5-ounce cookies. If you’re a student yourself, then our other specialty foods from Hawaii may prove to be just the pick-me-up you need to power through your challenging college courses. Drinking some of our Hawaiian Ka’u coffee along with a delicious coffee cookie will give you a caffeine kick as well as a flavor you can savor throughout the day, and our dark chocolate coffee bean crunch is the best tasting energy bar you’ve ever tried. Have a nibble when your energy levels start to wane, and you’ll be ready to get your head back in the learning game. Visit Hawaii’s Local Buzz to discover these and our other organic specialty foods from Hawaii. All of our products are made with ingredients from our own family farm on the Big Island.